I'm very curious about who have read my flash flipbook, where they come, and by what means to know my flipbook. So, is there a tool or feature in your flipbook software can helps settle my problem down? Hello, with using A-PDF to Flipbook feature of Google Analytics you can easy to track the flipbook page view. Google Analytics is a service offered by Google that generates detailed statistics about a website's traffic and traffic sources and measures conversions and sales. The product is aimed at marketers as opposed to webmasters and technologists from which the industry of web analytics originally grew. It is the most widely used website statistics service. How to apply the function of Google Analytics? Step1: Sign Up an account of Google Analytics with your Google account. Step2: Launch A-PDF to Flipbook software, import PDF for start a new flipbook project. 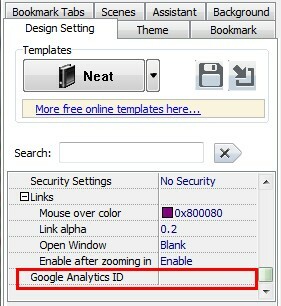 Step3: Find out “Google Analytics ID” bar (Design Setting -> Flash Control Settings -> Google Analytics ID), and then input your Google ID. Then you can login your Google Analytic to get data of your flipbook. A-PDF To Excel - extract and convert almost any PDF data (such as Invoice, Bank statement, Price list, inventory list. Etc…) to highly-editable Microsoft Excel document or CSV file format in several minutes. Photo Touch - Touch up your photos with just a few clicks, rotate, crop, bright, redeye, deck, etc.